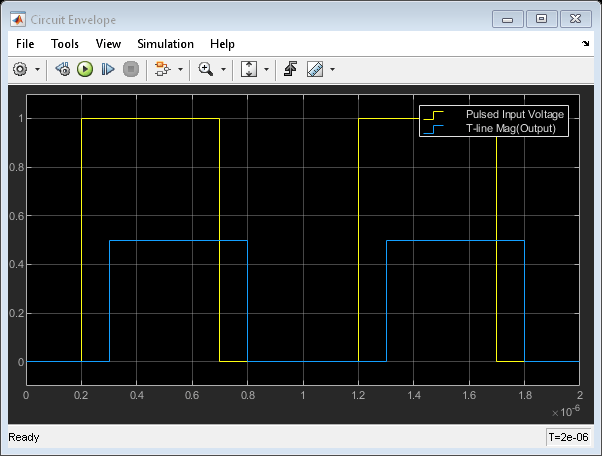 This example shows how to simulate delay-based and lumped-element transmission lines using blocks in the RF Blockset™ Circuit Envelope library. 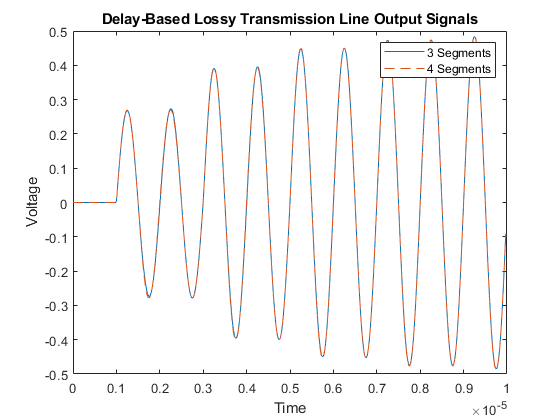 The example is sequenced to examine circuit envelope and passband differences, delay-based lossy transmission line sectioning, and lumped element implementation of delay. 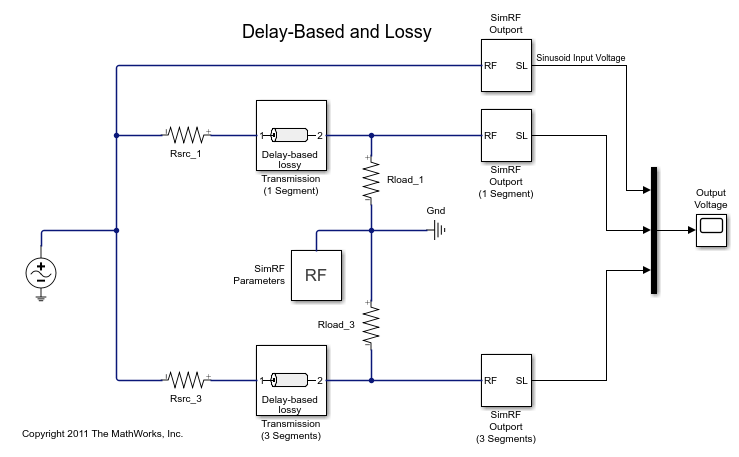 In this section, two RF Blockset™ models, simrf_xline_pb and simrf_xline_ce, illustrate lossless delay-based transmission line effects and the computational benefit of circuit envelope techniques. 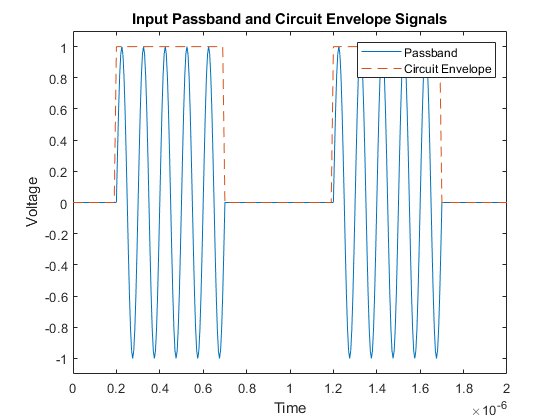 The input is a pulse-modulated sinusoidal passband signal. For this particular case, I(t) equals zero, and Q(t) is the pulse modulation. The carrier frequencies are set to zero in the RF Blockset Inport and Outport blocks. Again, I(t) equals zero, and Q(t) is the pulse modulation, but the carrier signal is not specified as part of the input signal. To model the carrier, the Carrier Frequencies parameter is set to in the RF Blockset Inport and Outport blocks. 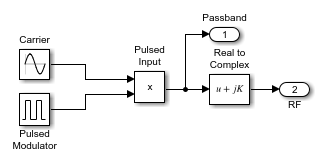 Removal of the explicit sinusoidal carrier in the circuit-envelope model allows the simulation to reduce time-steps relative to the passband model. Type open_system('simrf_xline_pb') or open_system('simrf_xline_ce') at the Command Window prompt. 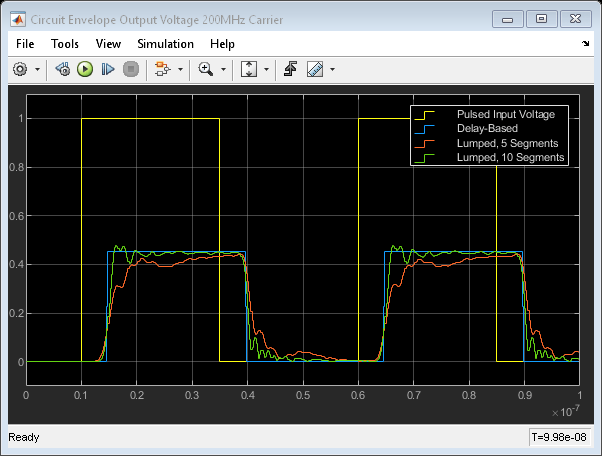 After simulating, the transmission delay is observable in a plot of input and output signals. 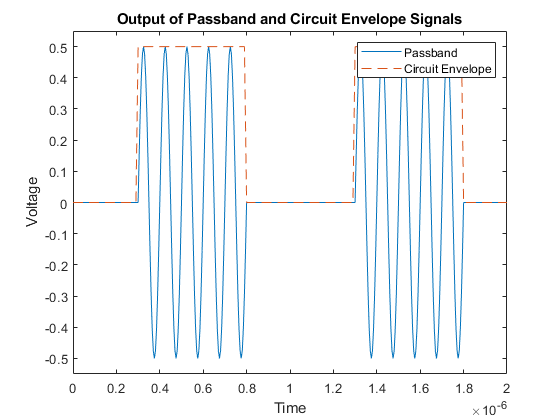 However, reconstruction of the passband signal this way requires additional time steps for the carrier. 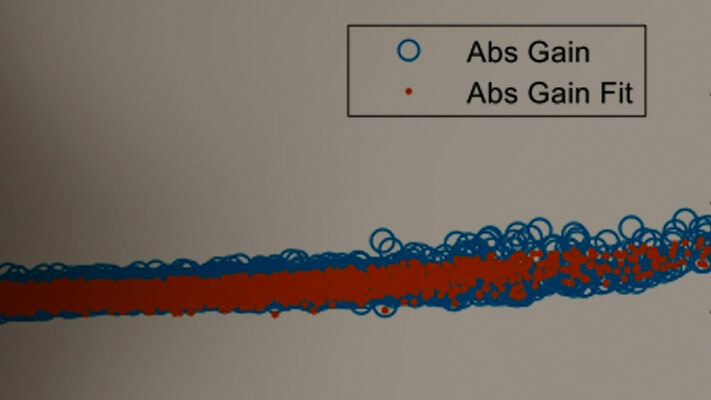 A conventional method for modeling distributed lossy transmission lines employs N two-port segments in cascade. Each segment consists of an ideal lossless delay line and resistance, where the segment delay equals the total line delay divided by N and the segment resistance equals the total line resistance divided by N. As the number of segments increases, the lumped model will more accurately represent the distributed system. This methodology requires a compromise between simulation time and model accuracy for increasing N. In RF Blockset, the Number of segments, the Resistance per unit length and the Line length are specified as dialog box parameters in the transmission line block. 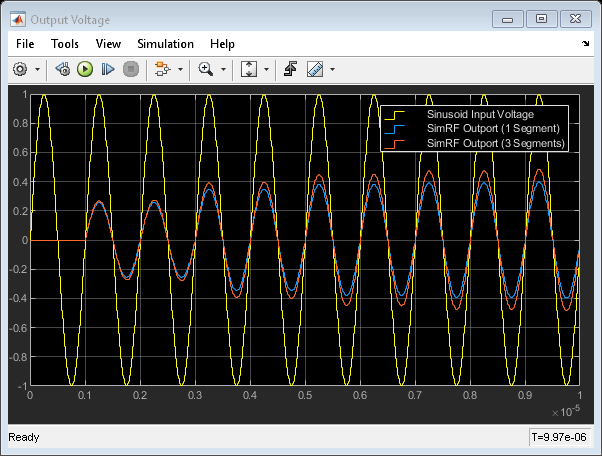 The lossy delay-based transmission line model, simrf_xline_seg, consists of two parallel arms excited by a RF Blockset sinusoidal source. The top arm employs a single segment transmission line, while the bottom arm uses a line consisting of 3 segments. The source and load resistances are not equal to the characteristic impedance of the transmission line. These differences affect the shape of the output response. For example, the output response will be overdamped when the source and load resistances are less than the characteristic impedance. Increasing the number of line segments in the bottom arm from three to four and comparing responses show that three segments suffice for this configuration. Type open_system('simrf_xline_ll') at the Command Window prompt. The following graph shows how the number of lumped element segments affects the output. 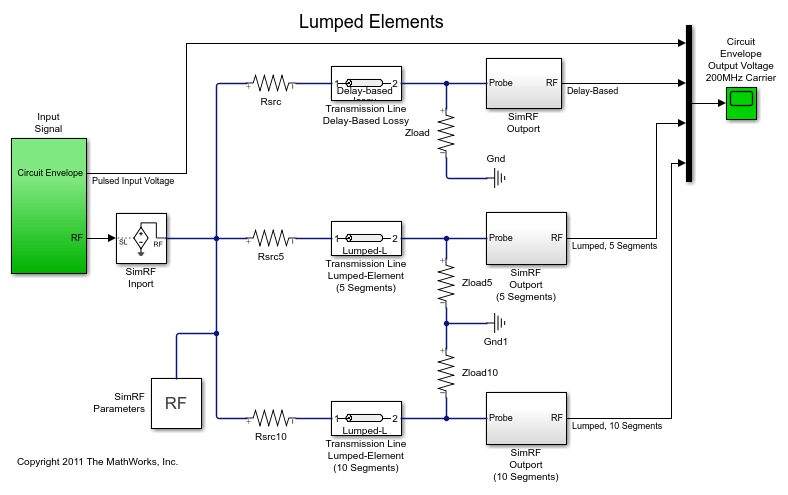 Speed and accuracy must be balanced when using the lumped-element transmission line block. Close the model and remove workspace variables.